Welcome to the 91st Kateri Circle information page. We are a group whose purpose is to promote Native American spirituality within the Catholic Church. We are an intertribal group and welcome everyone. Saint Kateri was born in 1656 in New York to a Christian mother and a non-Christian Mohawk Chief. Her parents and brother died in a smallpox epidemic which left Kateri's eyesight impaired, her face scarred, and it left her weak for the rest of her life. At the time she was only 4 years old. Tekakwitha met Father de Lamberville in 1675, and told him of her desire to be baptized. She took religious instructions and was baptized on April 5, 1676, Easter Sunday. She was given the name Kateri. After having to flee her village to the St. Francis Xavier Mission near Montreal, Kateri was able to receive her First Holy Communion. On Christmas Day, 1679, Kateri pronounced her vow of perpetual virginity. On April 17, 1680, Wednesday of Holy Week, she died at the age of 24. Her last words were, "IESOS konoronkwa" or "Jesus I love you." Fifteen minutes after her death, before the eyes of two Jesuits and all the Indians that could fit in the room, the ugly scars on her face disappeared. On January 3, 1943 she was declared Venerable by Pope Pius XII. She was Beatified by Pope John Paul II on June 22, 1980 and was canonized on October 21, 2012 by Pope Benedict XVI. 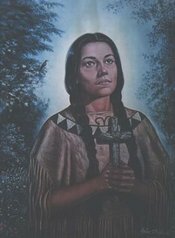 St. Kateri Tekakwitha's Feast day is April 17th in Canada and July 14th in the United States.